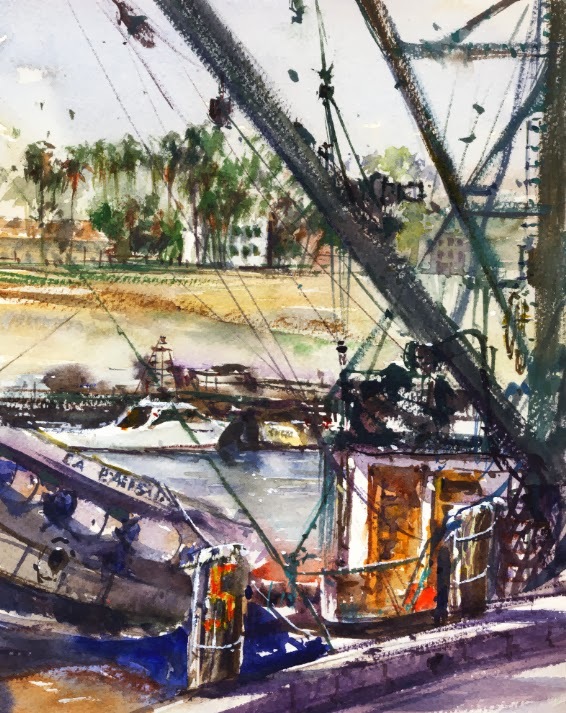 Last week one of the plein air groups met in San Pedro where the Port of Los Angeles is located. There is a busy touristy area called Ports 'O Call Village which features waterfront shops and restaurants beside a busy channel with cruise ships, cargo ships, and an occasional fire boat. Just across the parking lot is another channel where there are working boats, fishing net maintenance, etc. which is a neat place for plein air artists to paint. 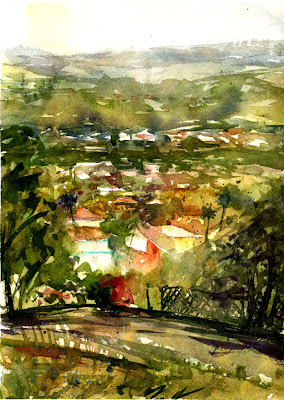 I painted there in 2012 and posted my watercolor in San Pedro. It was another beautiful morning at the harbor. Shade was hard to find again. I ended up painting close to a row boat and pile of nets which had some shade for awhile. There are so many exciting views to choose from. I was happy to be satisfied to try what I could see from my bit of shade. I will bring my umbrella next time. Speaking of next time, a fellow painter mentioned a plaza area at the end of the channel which I hadn't checked out before and there were wonderful views. That's where I'll paint from on my next paint-out there. At this spot was a fascinating public sculpture, a 40-foot-tall bluefin tuna suspended by its tail from a steel frame, titled Ghost Fish 107 by Carl Cheng. It commemorates the once thriving tuna fishing and canning industry which was at the site until it began shutting down a generation ago. (I remember an elementary school field trip to the Starkist cannery there.) The open frame fish is full of nets, buoys, tools, ropes, license plates, gauges, and other detritus resting at its head. The fish's eye was especially playful and appealing. 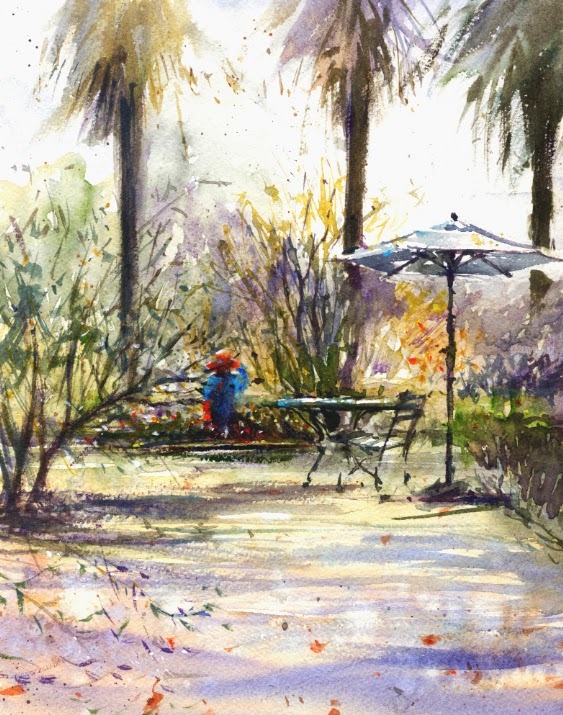 No matter what time of year, Arlington Garden in Pasadena is a lovely place to visit and paint. One of the plein air groups met there a few weeks ago on a beautiful day. It's still "summer" in January here and we need rain. The last time I painted there was in early October and posted the two paintings from that day in Fall at Arlington Garden. I've painted at the Garden quite a few other times, links under "Arlington Garden" in my Label section on the right. There are many beautiful "garden rooms" with views, tables and chairs, umbrellas, dry fountains planted with cascading succulents, garden art, orange trees, a dry river with a small bridge, the desert garden, charming amphitheater, labyrinth, and much more. The irises were starting to bloom and the sun in that area wasn't too hot for painters but a view in the Mediterranean Allee, olive tree area caught my eye. It's where I painted in October but it seemed very different in January. The pomegranate trees were now leafless and the light had changed as the sun's path changed with the season. For the watercolor I painted in the fall, I added a figure sitting at a table. This time I painted a table but tried adding a figure walking away, down a slope to the east. 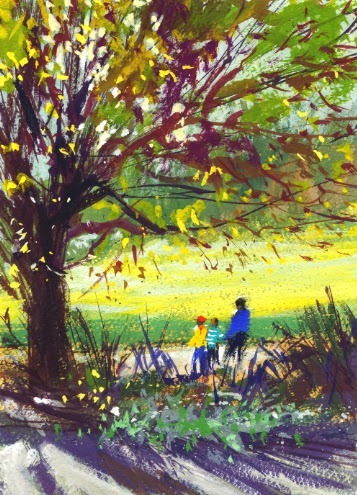 I'm looking forward to painting at the Garden again in the spring! 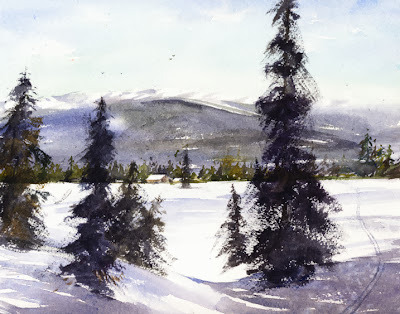 My first try at a plein air gouache piece was in December 2012, blog post Ward Ranch, a very dreary and rainy day. We're having summer-like weather in January so I was looking forward to another paint-out at the E. Waldo Ward Ranch in Sierra Madre. This time I painted a transparent watercolor piece. The morning was gorgeous and this small 1891 ranch and orchard is so charming. It's also a canning operation. The gift shop sells wonderful jams, jellies, and other goodies. There are the fruit trees, an old barn, lots of rusty old equipment, and a beautiful yellow house. I settled on a view from under a tree of some of the fruit trees, a stone building, and a birdhouse which is a small version of the old barn. 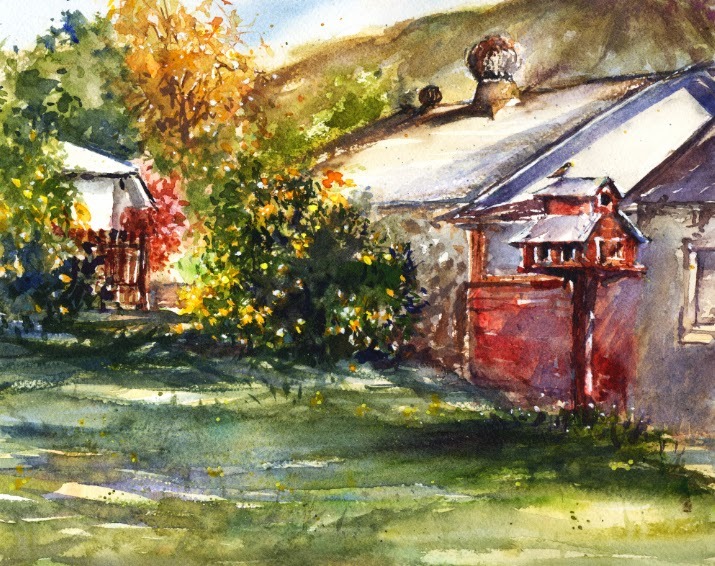 It's great to have permission to paint at the ranch and see such a large turn-out of painters. Brenda Swenson leading the crit after painting. Our paint-out destination on Saturday was the Self Realization Fellowship Center on top of Mount Washington in Los Angeles. 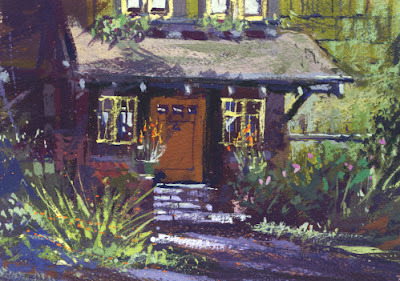 I painted there in May 2012, one of my earliest paint-outs, and I was looking forward to the beautiful, calming grounds. But, the Center was closed for a special event! I'll add my painting from that first paint-out. It's the view of the homes and rooftops in the valley below the Center. With the Center closed, we started looking around since the area is very lovely, lots of trees, and great views. As we were admiring an unusual and beautiful craftsman home the owner came out, just off to work. She stopped to chat with us since she is also a painter. We asked for advice on nearby painting spots. Then graciously she invited us in to see an oil painting a friend did of a hillside view of the Griffith Observatory. We noticed some of her paintings and enjoyed seeing more of her artwork and spectacular art studio. Our new friend left for work and we all chose views of her home to paint. Since complicated architecture has its difficulties, I painted a small gouache so I could make some corrections if needed. Not so easy to do with transparent watercolor. It was fun sitting in the shade painting with friends. What a serendipitous morning! Self Realization Fellowship Center gates closed! Transparent watercolor approx. 8.5 x 11.5"
One of the paint-out groups I'm in had our quarterly planning meeting last week. We all get together and suggest locations where we'd like to paint. We always meet at the local Arboretum which has a nice cafe and patio. Then we paint after our meeting and gather again for lunch, and to share our artwork. After our last meeting in the fall, I painted The Roofers in gouache. Several other plein air paint-out pieces at the Arboretum can be found in my Label section on the right. It was such a nice "summer-y" day in January for us painters. We are having unusually warm weather here. I always feel short on time after our planning meeting and our "deadline" to be back at the cafe. I checked out several of my close-by favorite areas but nothing appealed to me. Nothing looked like a "painting". There's a lovely greenhouse section that is great for photos but I haven't figured out how to paint it yet. I just went back to the cafe area since it's up some stairs and has a nice view. Wow, the afternoon sun shining through and back-lighting some trees looked like a neat subject to try. There's a walkway with people passing by too. I ended up with a fun gouache piece. As usual we shared the patio with some preening peacocks. As I mentioned last month in my post Virtual Paintout 16! (Iceland), I was looking forward to the paint-out location for December. It was Venice, Italy! Wow! I WISH I could see Venice in person but that opportunity hasn't happened yet. I really enjoy participating in the online Virtual Paintout created and hosted by Bill Guffey each month. Bill chooses the locations based on areas the Google Street View vehicles have covered. 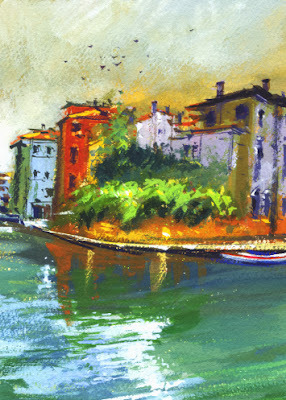 Artists choose a view to paint, just as they would on any plein air paint-out and submit their finished pieces to Bill. He posts them all on Facebook and his blog. It's very exciting to me to see so many places all over the world, up close, that I'll never be able to visit. 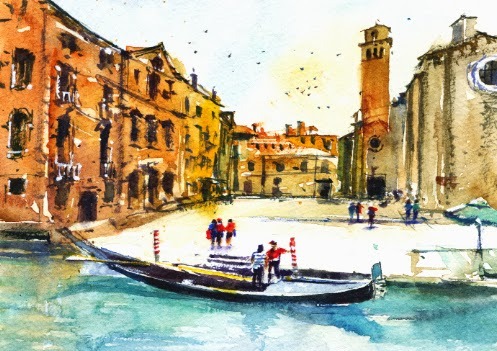 I think Venice was the most inspiring Virtual Paintout I've been on yet, judging by the links of possible views I sent myself. I found something I would like to try painting around every corner. What an interesting and stunning place. 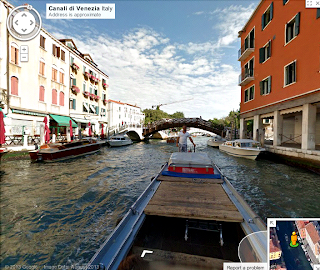 One thing I was curious about was whether the Google cameras would be on boats in the canals, and they were. Since I'm always short on time for the month-end deadline after too much browsing, I painted a small watercolor and a small gouache. 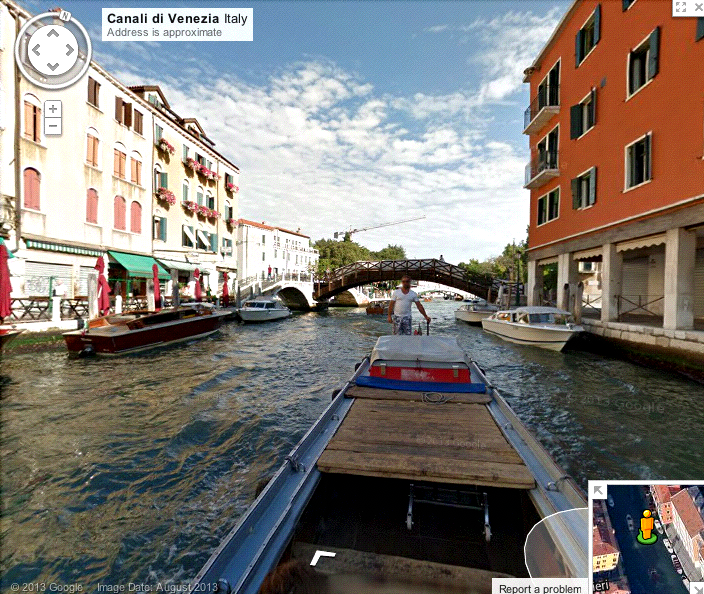 I'm including a typical Google Street View shot from a canal boat in Venice too. It's January 1st.! It's wintertime but here in Southern California the temps are in the 70's. Well, yesterday, December 31st., I was painting a snow scene. Not a plein air snow scene. This watercolor was for Vinita Pappas's online watercolor class, Create 38, after her demo. Vinita showed a neat technique for painting the pines using a splayed, dry, mop brush. I always learn something from her demo videos. I was feeling pretty chilly while painting this. The tracks in the snow just make it I think. I can't seen to get my sky colors to show up well online. On New Year's Eve every year after our early dinner out, we stop by the local South Pasadena Rose Parade float construction site. Most all of the parade floats are decorated by commercial float builders. Our float is "self-built" by South Pasadena volunteers, which only a few local cities do. I'm including a photo of the finished float ready to head out to Colorado Boulevard in a few hours. A Happy New Year wish to all of you wonderful blog readers!